Having decided to buy a new clock for our new home we considered various aspects. 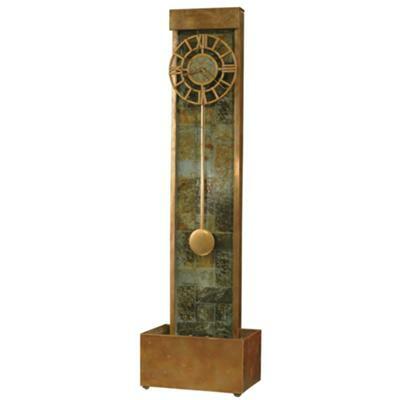 Should it be a new modern clock or a timeless old grandfather clock? The clock should do more than just tell the time, however still pass to our lifestyle. As the air in our home is often dry we thought about buying a humidifier to keep the air moist. After much research in internet we hit upon the perfect solution, a waterfall clock, a clock and a humidifier. Our excitement grew when the clock arrived. It was quite easy to put together. We now have a delightful, lighted waterfall in our entrance hallway. Almost every visitor to our home comments positively on it. The cascading of the water is so calming, illuminated by the light at the base, coupled with the tick-tock of the clock’s mechanism. We are very happy with the result. A further plus is the natural, weathered stone look that fits in perfectly with our modern décor, however I am sure this clock would look good in any home, whether traditional or modern.